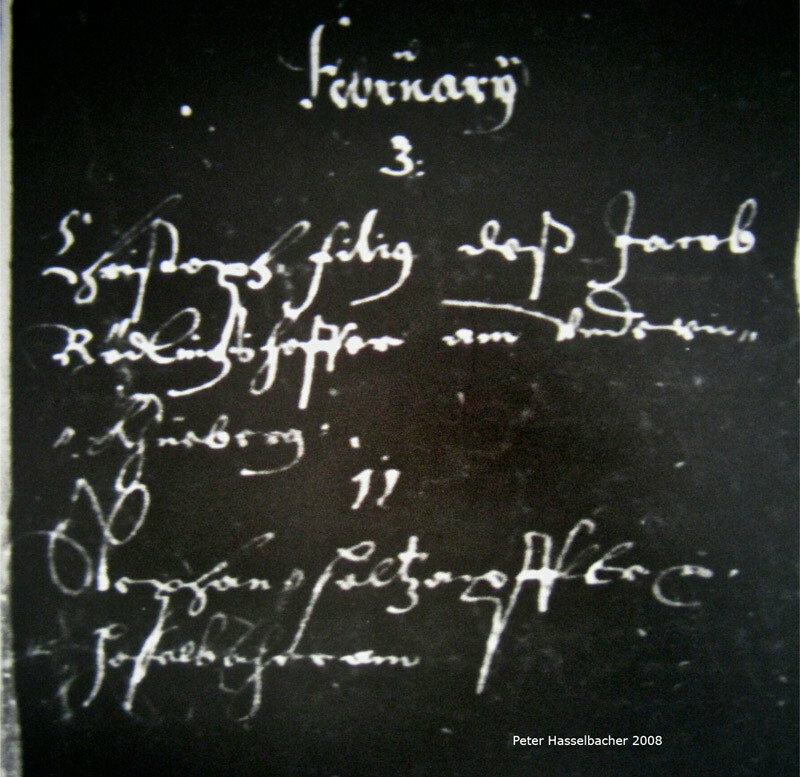 I had previously seen transcriptions of some church records from Gresten, Austria that had been prepared by Pfarrer Georg Kühr. Pfarrer Kühr did extensive genealogical research that included the Hasselbacher family. I suspect, but have not confirmed, that he is a Hasselbacher descendant himself. Copies of the transcriptions in modern German were provided to me by a wonderful relative who wishes to remain anonymous. Recently I discovered that the original church records had been microfilmed by the Church of Latter-day Saints. I had a chance to look at them in July 2008. With these records as a guide, and with some dates I obtained elsewhere, I was able to identify a number of entries for the Hasselbacher family. The books were not in good condition and the copies sub-optimal. If I had not had the dates to guide me, I doubt I would have had much success. I will post all that I found, but for starters, and until I find that there is some interest from others, I post two below. The first is the wedding of Andre and Anna Haselbacher. 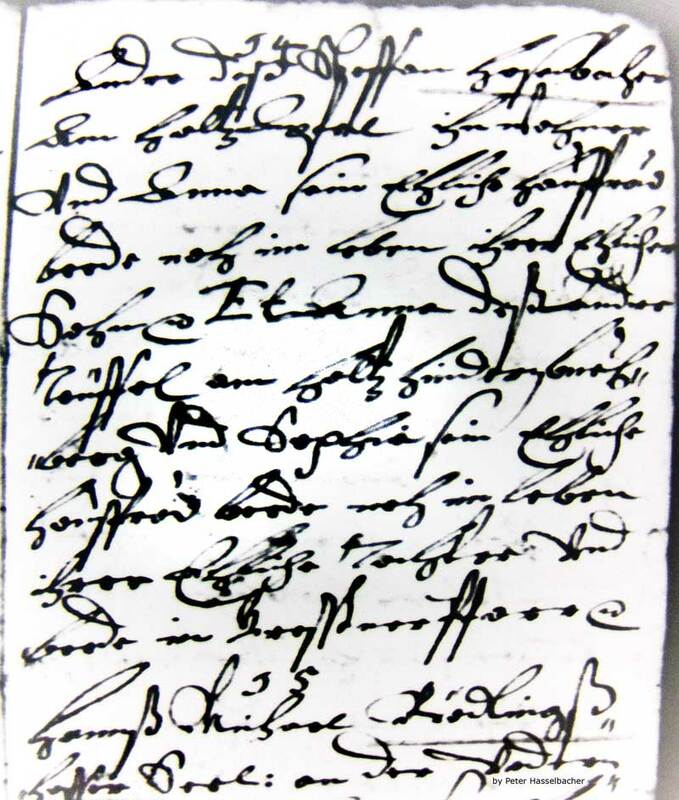 The second, most difficult of all to read and yet the most precious, is the record of the death of my 10G Grandfather, Stephan Haselbacher. I can confirm that Hasselbacher was occasionally spelled with a double "s" or scharf. To summarize: The top center shows the date, 14th, just above the line. 14. Andre des Steffan Haselbacher am Holtzapfel Innwohner und Anna sein ehliche Hausfrau beide noch im Leben ihrer ehlicher Sohn eodem et Anna deß Andre Teuffel am Holtz hindern Buechberg (?) und Sophia sein ehliche Hausfrau beide noch im Leben ihrer ehliche Tochter und bende in Gresstner Pfarr eodem. The entry following the date: Feb 11th.